At the beginning of the week, I posted briefly about my productive Sunday. As I wrote, on that fragrant and flavorful afternoon I made up a batch of fresh pasta, handmade meatballs, and not one, but two tomato sauces, all from scratch. What I had originally imagined would work out to be a “set it and forget it” kind of day ended up being an involved afternoon of slicing, dicing, stirring and sampling, which lasted from about 3:00 in the afternoon, to about 10:oo at night when I finally wrapped my spinach pasta dough in saran wrap and headed for bed. One of the sauces that I endeavored to produce began as a simple marinara, but blossomed into so much more. Before my shopping trip, I had read online that a good red sauce (which, as a side not, I refuse to refer to as “gravy,” as some of the more pretentious foodies tend to do) can really have just about anything in it as long as it’s built on a solid base of garlic, onions, tomatoes and spices. While my intention was to make a simple sauce, perhaps just with those few ingredients, the moment I stepped into the grocery store, and saw aisles upon aisles of culinary opportunity, I knew that the original plan was shot to hell. 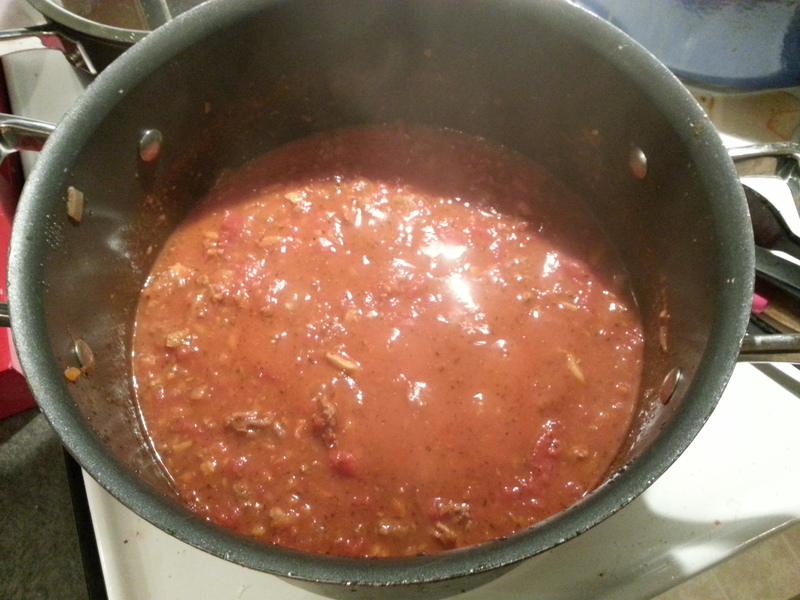 Before we begin, let it be hereby recorded that I had fully intended to use fresh tomatoes for the sauces. Upon arriving in the produce section, however, it became clear that the specific tomatoes I desired were either unripe or unhealthy looking, and as a result I settled for a cartload of the canned variety instead. 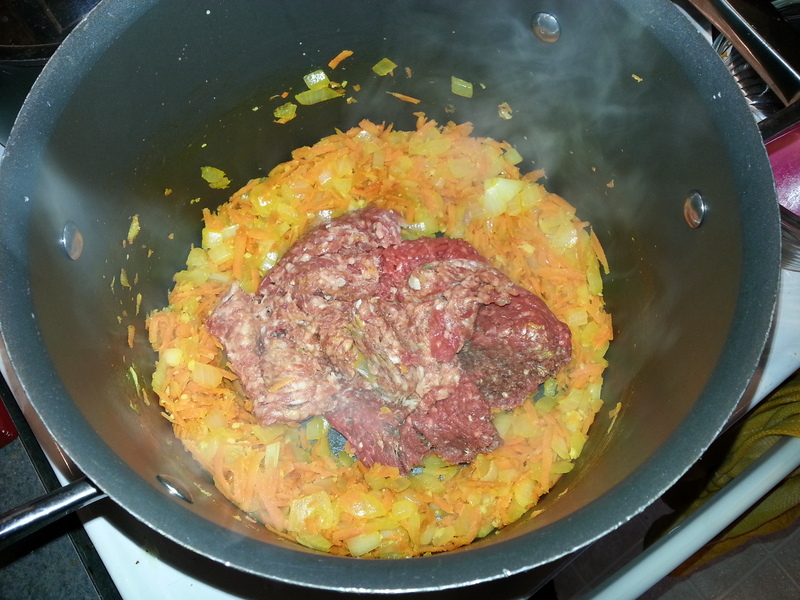 I stared with a few tablespoons of olive oil over medium heat, to which I added the carrots and onion. Once the chopped onions were translucent (after about three minutes of stirring) I added the garlic and the two tablespoons of Italian spices, and cooked for about a minute. As the spices began giving off a nice toasty aroma, I made a well in the mixture, and placed the various meats inside to brown. 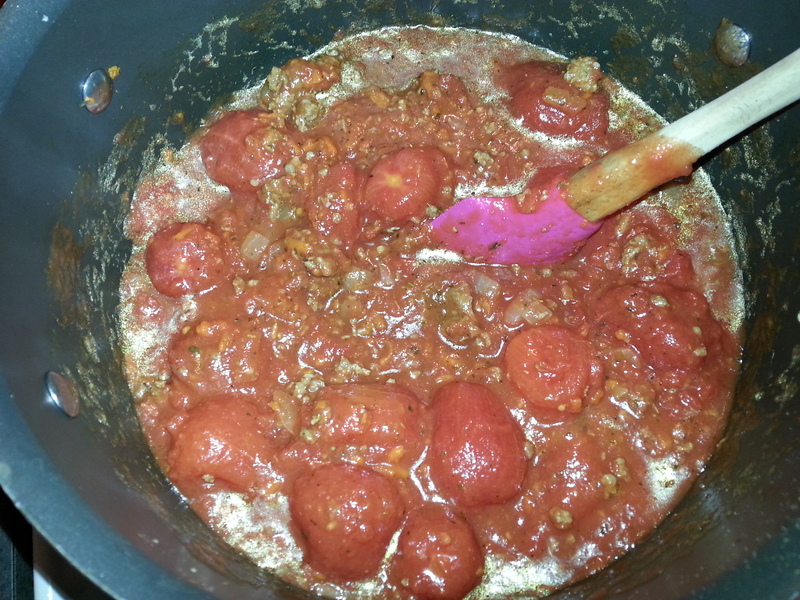 After browning the meats, stirring periodically, for about five minutes, I dumped the wine and tomatoes unceremoniously atop the mixture, and gave the whole thing a good stir. From that point, the cooking process became one of waiting, watching, adding salt and pepper, and stirring, as I allowed the whole thing to cook on medium-low for the afternoon. I waited for about two hours before folding in the mushrooms, not because I had planned it that way, but because I had forgotten them at the bottom of a shopping bag and had discovered them partway through the cooking process while frantically searching for another lost ingredient. After about five hours of cook-time, what had started as a chunky mixture of ingredients became a smooth and mouthwatering concoction that was missing only one thing: Meatballs. In the end, the sauce itself was not acidic, as I had worried it would be, and was a wonderful balance of savory flavors with hints of the individual meats and spices. Enjoy this one, if you have the time!